A throwback to old-fashioned disaster movies, Daylight faithfully follows a well-established formula. Almost devoid of new ideas, the movie makes up for it with good intentions and professional execution. An industrial company illegally transports highly explosive waste material by truck through the Holland Tunnel linking Manhattan with New Jersey. At the same time a group of low-life thieves speed through the tunnel in a getaway car, eventually triggering a multi-car crash, a massive explosion, and a fireball that incinerates many cars and collapses large sections of the tunnel. 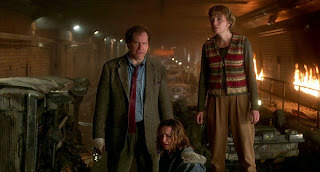 A few survivors are trapped in an air pocket, including tunnel security officer George (Stan Shaw), struggling writer Madelyne (Amy Brenneman), celebrity extreme sportsman Roy Nord (Viggo Mortensen), a group of in-transit convicts, the Crighton family consisting of dad Steve, mom Sarah and daughter Ashley, and an elderly couple with a dog. 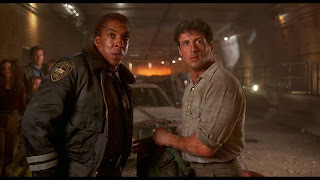 Disgraced former emergency responder Kit Latura (Sylvester Stallone) happens to be near the tunnel when the explosion occurs, and takes the initiative. Activating a limited-time emergency stop mechanism on the massive ventilation fans, he finds his way through air vents to the air pocket. But some of the survivors are unsure if they can trust Latura due his chequered past. With the weakened tunnel about to give way under the weight of the river and the fire spreading, Latura desperately tries to find a way to help the survivors to safety. Evoking the memory of early 1970s disaster dramas like The Poseidon Adventure and The Towering Inferno, Daylight traps a few people in a confined place between fire and water, with rescue by others far away or all but impossible. The survivors have to overcome personality conflicts and work together to survive, and not all of them will make it. Apart from tiredness, there is nothing too wrong with the premise. The collection of characters trapped in the tunnel is the typical variety of the young, the middle aged, and the elderly, plus one pet. In the opening 15 minutes their backstories are sketched-in with just enough definition to provide some vague interest, but Daylight will never be mistaken for a character-driven film. The tension stems from the tunnel gradually destroying itself, the air pocket growing ever smaller, with both the water and the desperation levels creeping higher. For a Stallone movie, Daylight provides the hero with plenty of welcome humanity. The Leslie Bohem script moves far away from any over-confident macho heroism for Kit Latura. He is instead presented as unsure, realistic, and doing the best he can in catastrophic circumstances. His past as a man responsible for the death of a rescue crew is a constant companion, and Latura is unsure if this test is a chance at redemption or an opportunity for an even more disastrous outcome. As far as Stallone goes, this is among his better acting efforts. The supporting cast is mostly television-calibre, and they don't offer much to suggest otherwise. Viggo Mortensen is the exception, but his charismatic Roy Nord, a Richard Branson-type personality, proves to be too fearless given the circumstances, and he is among the unfortunate early departures. 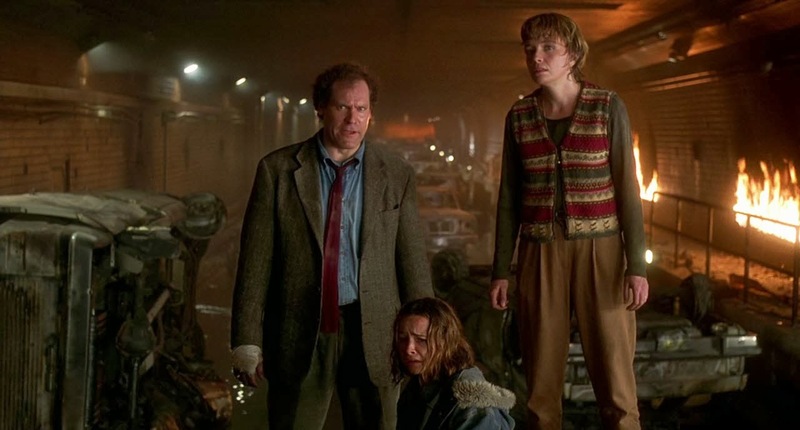 Director Rob Cohen, also with roots deep in television land, scrupulously follows the predictable steps of a disaster movie, but does delivers an outstanding sequence to capture the moment of disaster. When the explosion rocks the tunnel, the firestorm and car destruction that follow are a well-orchestrated symphony of carnage. Daylight entertains within its well-defined limits. The tunnel has a familiar alignment, and no unexpected curves.